It is widely held that context is important in teaching mathematics and statistics. Consideration of context is central to statistical thinking, and any teaching of statistics must incorporate this aspect. 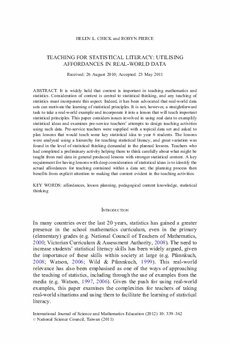 Indeed, it has been advocated that real-world data sets can motivate the learning of statistical principles. It is not, however, a straightforward task to take a real-world example and incorporate it into a lesson that will teach important statistical principles. This paper considers issues involved in using real data to exemplify statistical ideas and examines pre-service teachers’ attempts to design teaching activities using such data. Pre-service teachers were supplied with a topical data set and asked to plan lessons that would teach some key statistical idea to year 6 students. The lessons were analysed using a hierarchy for teaching statistical literacy, and great variation was found in the level of statistical thinking demanded in the planned lessons. Teachers who had completed a preliminary activity helping them to think carefully about what might be taught from real data in general produced lessons with stronger statistical content. A key requirement for having lessons with deep consideration of statistical ideas is to identify the actual affordances for teaching contained within a data set; the planning process then benefits from explicit attention to making that content evident in the teaching activities.